NEGROMANCER 2.0: Image Comics Announces New Storyline for Kirkman & Azaceta's "Outcast"
Image Comics Announces New Storyline for Kirkman & Azaceta's "Outcast"
Bestselling creative team of Robert Kirkman (THE WALKING DEAD, INVINCIBLE) and Paul Azaceta (Daredevil, Punisher Noir) will launch a new story arc in their ongoing horror series OUTCAST BY KIRKMAN & AZACETA from Skybound this July. 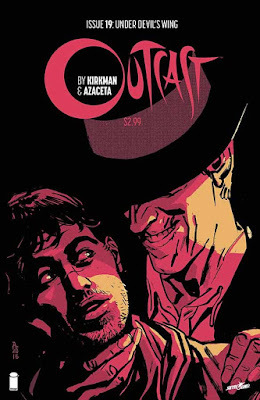 Previously in OUTCAST BY KIRKMAN & AZACETA, Kyle was faced with the most emotional exorcism he’d performed yet, as he learned more about his abilities and what’s really happening around him. Secrets were revealed that changed everything. In OUTCAST BY KIRKMAN & AZACETA #19, answers are given and secrets are revealed, as the start of a new story arc finds Kyle and Sidney having a conversation that will change EVERYTHING. Kyle has never been in more danger. "What I love about where we are now in the story is that we're getting to really see the scope of what's happening,” said Azaceta. “If you thought it was scary when Kyle and Anderson were dealing with one possessed child, you're going to be in for some big fun." OUTCAST BY KIRKMAN & AZACETA #19 (Diamond code: MAY160605) hits stores Wednesday, July 27th, 2016. Final order cutoff deadline for retailers is Monday, June 27th, 2016.